Intuit ProConnect ProSeries Professional Edition has the ability to create and email a Password Protected (encrypted) PDF files of a taxpayer's tax return to the taxpayer. 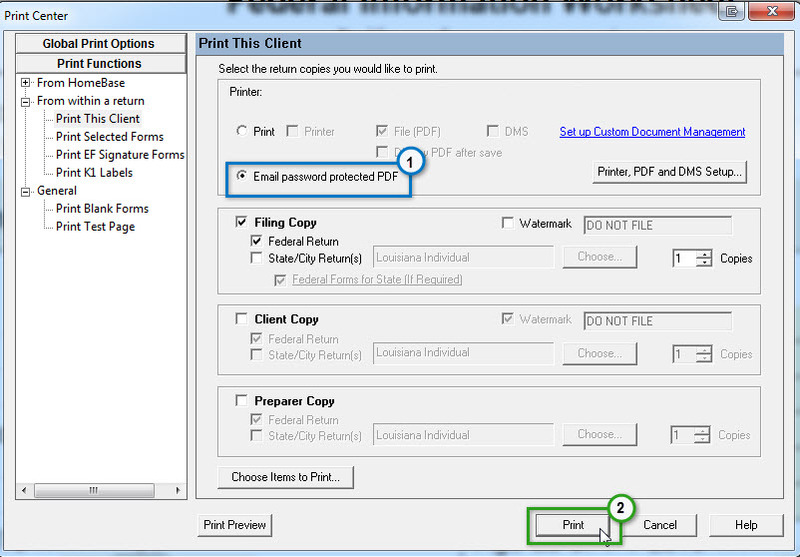 When selecting to create and email an encrypted PDF in ProSeries, the items selected to be included in the PDF will be emailed to the taxpayer's email address entered on the Federal Information Worksheet in the Federal tax return. The email will be delivered to the taxpayer using the preparer's email address entered in the ProSeries Options under Firm/Preparer Information. The encrypted PDF file will be created with an automatically generated password created from information in the tax return. The email the taxpayer receives will contain a brief set of instructions explain how to determine the the password that must be used to open the encrypted PDF attachment. The password cannot be manually set and the tax payer will need to know the information described in the included instructions in order to view the tax return. The path to ProPDF may be set incorrectly or have additional characters. The path may have an extra \ between ProPDF and TY2018. 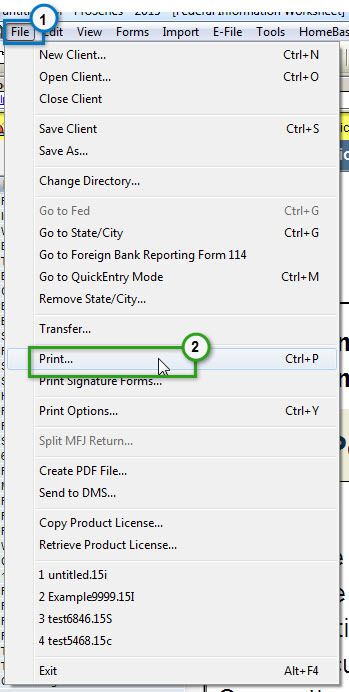 Go into Printer, PDF, and DMS settings and click browse next to the PDF path and navigate to the ProPDF\TY2018 folder and set that as the new path. Feature only supported by specific fully MAPI-compliant email clients. Click the Print button (2). Note: Alternatively, Choose Upload the PDF File and email a link (1). This option allows the taxpayer to access their email without having to store the Attached PDF in their Email. Documents uploaded using the Intuit Cloud Service will remain available for taxpayers to access using a link in the email until December 31st of the current tax year. The review and modify the email in Email Preview screen and then click the E-Mail button (4) to send the email with the attached encrypted PDF file to the taxpayer. Note: Changes to the email template can be saved for all clients by clicking the Save for All Clients button (1). The email template can be reset by selecting the Restore Default Text button (2). 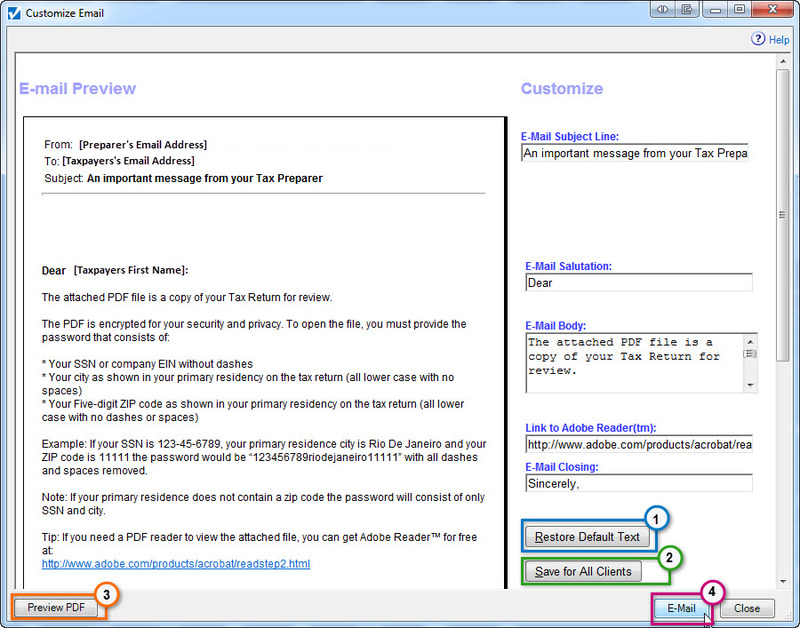 Click the Preview PDF button (3) to preview the PDF that will be attached to the taxpayer's email. 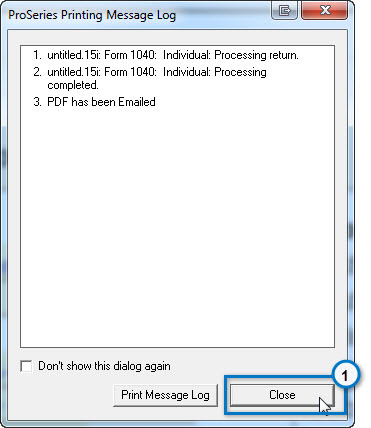 Click the Close button (1) to close the ProSeries Printing Message Log. 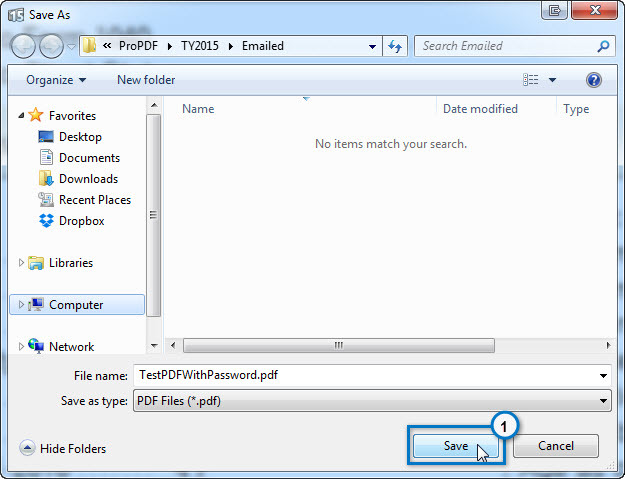 A copy of the Password-protected PDF that is emailed will be copied to the ProPDF folder on your computer's hard drive under the corresponding tax year in a folder named "Emailed". This default location will be C:\PROPDF\TY18\Emailed for ProSeries Professional 2018 . To use the Email Password-protected PDF feature, you must also have a 32-bit, ExtendedMAPI-Compliant, e-mail client application. SimpleMAPI-compliant e-mail clients may not function correctly. All 64-bit versions of Outlook, Outlook Express, and Windows Mail are not supported by Email Password Protected PDF, the ProSeries Client Checklist, nor DMS. All web-based versions of Outlook, Outlook Express or Windows Mail are not supported by Email Password Protected PDF, the ProSeries Client Checklist, nor DMS. All webmail services (such as Outlook.com, Outlook 365, Gmail, Yahoo, AOL, etc...) are not email client program install on the local computer and are therefore not supported.